Barreto Cellars: Tempranillo out in force at Monterey Street Wine Co.
Tempranillo out in force at Monterey Street Wine Co.
Last night, Friday I was the featured guest at Monterey Street Wine Company in San Luis Obispo. 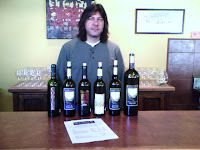 I was there to discuss the flight of Tempranillo wines being poured. Thank you to all who came out to taste the wines and support us. The flight was designed to start out with an approachable and inviting Spanish version of the Tempranillo variety and establish and old world reference. The wine was Codice from the Dominio de Erugen of Spain. It is very new world on the nose (fruity and oaky) with a simple but inviting mouthfeel and finish. Then it was off to California for a Tempranillo from Barreto Cellars and the appellation of Lodi, the wine was showing very nice with spicy oak notes and an abundance of ripe fruit on the front and a soft finish. Next Twisted Oak was up with its Calaveras County release. Spicy and jammy with ripe fruit and good body. Venturing North, the Umpqua Cuvee from Abacela Winery of Oregon was poured. A blend of different vineyards from the region give a good sense of terroir, relaying that the grapes do not originate from a dreary, cool and wet region like most people associate with Oregon wine regions. Dark in color and firm tannins with cherry earthy notes relay the varieties European heritage. The Barreto Cellars from Paso Robles was then poured, which exhibited mature and complex dark fruit with a gentle spiciness conveying the wines aging process. The wine was full in body with firm yet ripe tannins and a gentle yet lengthy finish. I wrapped up the flight by bringing out a bottle of single barrel Barreto Cellars-Arroyo Grande Tempranillo. This wine wrapped things up very nicely with it fruit forward nose, dark color, deep concentration and complex tannin structure. I enjoyed working with John of Monterey Street Wine Company to set up this tasting and bring some of the faces of Tempranillo to all those that attended. Once again thank you to all that attended and to George for being a blog loyal reader.